Classes are for all ages and abilities, and are ongoing. Lessons include fundamentals, choreography, costume design, zill and drums patterns, veil work, and performance opportunities. The recreation building has the perfect setting in which to practice with a lot of room, wood floors, and a large mirror along one wall. Wear comfortable clothes and a hip scarf if you have one. Thursday nights are when the troupe members practice choreography and plan our performances. 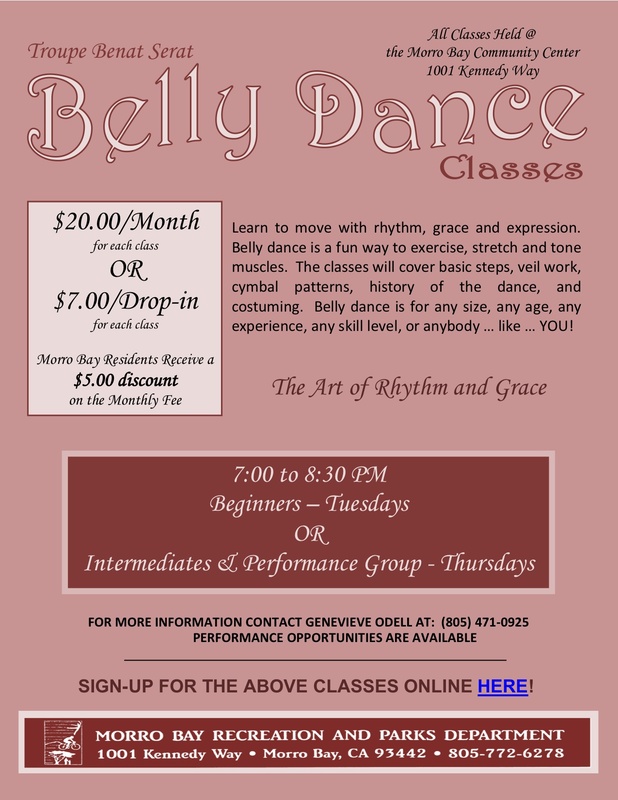 I am a resident of Los Osos and I would like to get more information about the Belly Dancing classes. When does the next class start? Sorry for the delay! Classes are every Tuesday 7pm at the Morro Bay Community Center. The classes are non-sequential, so you can start at any time! People of all ages and ability levels are welcome! We can’t wait to see you there! From 41 you would turn left at the stop sign onto Main St. After going under the freeway, you’ll come to a stop light at Quintana, and there you’ll turn left. You will then turn right onto Kennedy Way. The community center is on your right, and the classes are in the gymnasium area straight ahead! There aren’t any scheduled Tuesdays off, so come by any time you’re ready!